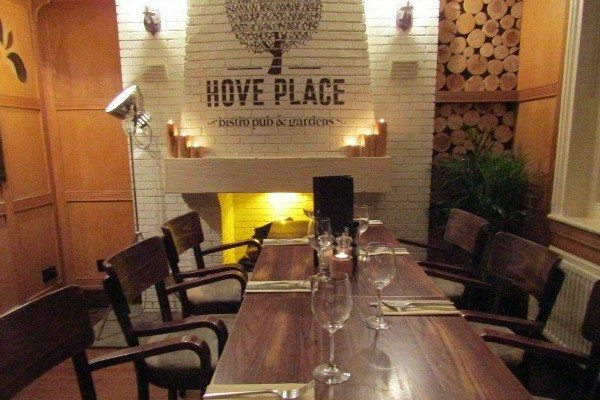 Hove Place is a brilliant marriage of traditional British pub and high-end eatery. 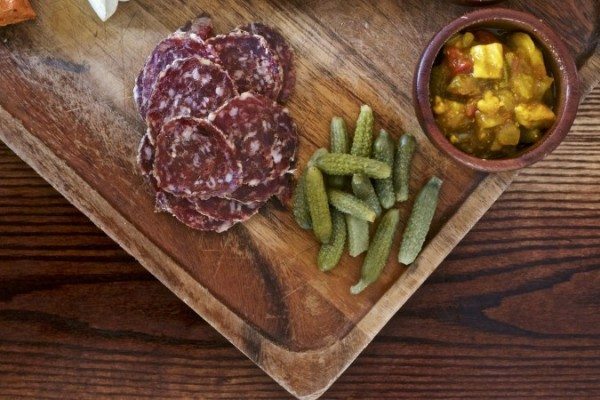 You can still find your classic pub grub, or sit in the beer garden with a pint but you can also indulge your taste buds with some truly top notch gastronomy. Head chef of five years Phil Bartley is passionate about British produce and has diligently sought out the best ingredients that our green and pleasant land has to offer. Phil and his team strongly believe in animal welfare and use only traditionally farmed free-range meats and eggs and sustainably caught fish. 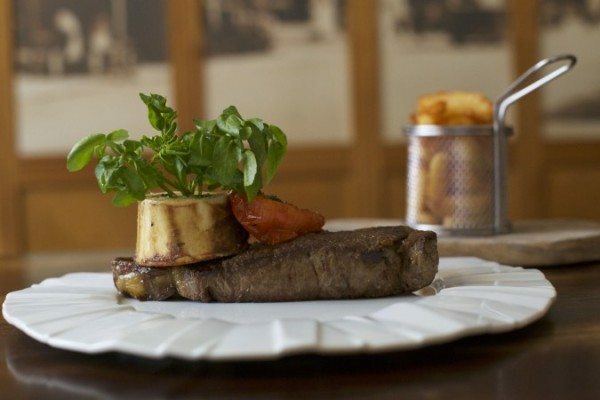 Their beef, which is hung for a minimum of 35 days for maximum flavour, is reared in Sussex and comes from rare, slow-growing breeds. Their pork comes from free-range pigs who live out a happy existence wandering the South Downs. Their lamb comes from Standean farm in nearby Patcham and their fish is freshly caught daily by boats based in Newhaven. 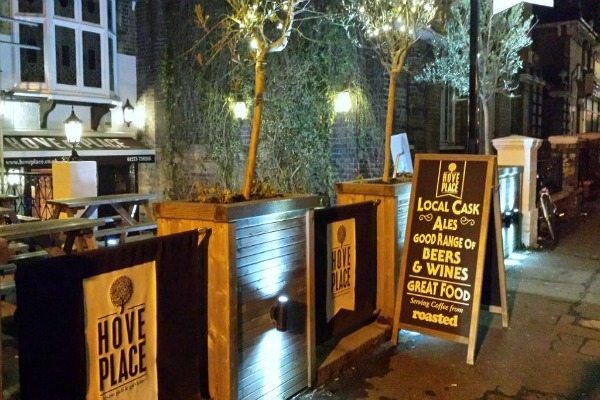 Hove Place is just off Church Road in Hove and is extremely easy to get to with bus stops nearby and a taxi rank a stone’s throw away in Palmeira Square. 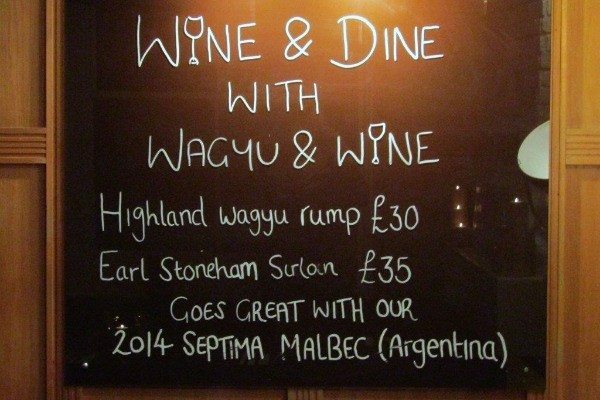 To drink we decided to go for chef’s recommendation, the 2014 Septima Malbec, which was an excellent choice, a gorgeous, smooth, spicy Argentinian red. 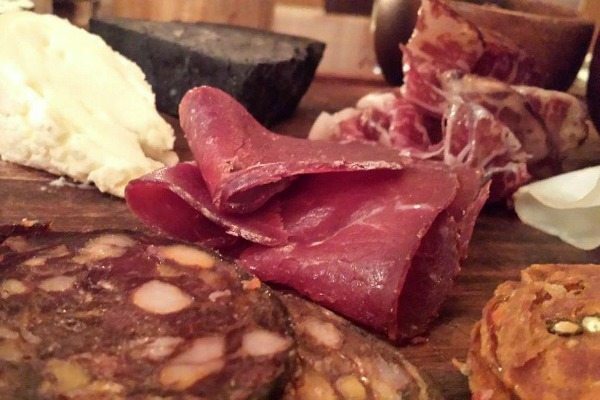 We were then brought out the most beautiful selection of home-made breads, cheeses and cured meats. Among the meats there was Air-Dried Ham, one of the more delicately flavoured meats but utterly delightful (try this one first before your taste buds are overwhelmed by stronger flavours), Dorset Warmer, a spicy pork salami with four different types of chilli and a slow, subtle burn, Walnut Salami, a delicious, award-winning salami with garlic, black pepper and walnuts, Wagyu Sashimi, thinly sliced, cured, wagyu beef, delicately marbled with fat and absolutely mouth-watering, Truffle Lardo, the chef’s favourite, glistening white slices of fermented back fat infused with British truffles – now I’ll try anything once but I must confess this one was a step too far for me, though Andrew happily polished it off. Then it was onto the Oak-Smoked Venison, dry-cured wild venison, smoked and aged for three months, just exquisite and finally, my unexpected favourite, Blood and Chocolate Chorizo, which was rich, savoury, beautifully spiced and dangerously moreish. All of which was accompanied by little pots of sweet, tangy, lightly-spiced tomato chutney, fantastic crunchy piccalilli and a little heap of pickled gherkins. The cheeses included Barkham Blue, otherwise known as “the blue cheese for people who don’t like blue cheese” (and I can attest to that), a lovely creamy cheese with a distinct but not overpowering flavour, Burwash Rose, an orange-rinded, rose-washed semi-soft cheese, the chef’s favourite, delicate, luscious and silky smooth and last but not least a hefty wedge of extraordinary jet-black Charcoal Cheddar, which I found a little challenging as I struggled to get past the fact that I was eating charcoal (!) but the unusual flavour was a relatively subtle dimension of what was also a good strong, creamy, mature cheddar. 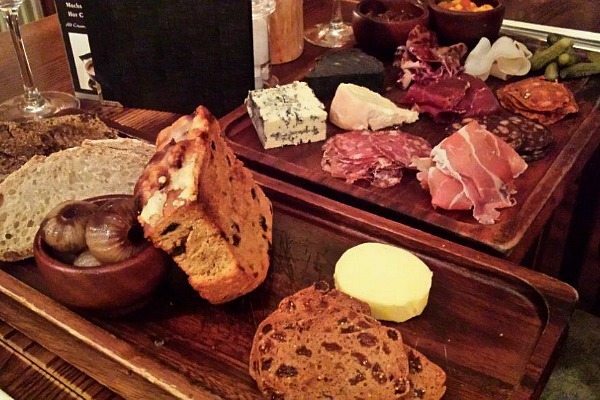 The bread board was generously loaded with a rich, sweet, moist, walnut, raisin and treacle bread, a wonderfully light sour dough bread with a lovely crisp crust, a veritable doorstop of gorgeous, soft, cheese-topped focaccia and thin, crunchy slices of yummy raisin and sultana toast. There was also a little bowl of pickled onions, which were sweet with a hint of sharpness but not eye-wateringly vinegary and a good-sized knob of butter. Andrew summed it up perfectly when he described it as the most pupil-dilating starter ever! We needed a substantial pause before the next course but fortunately the lovely lass who served us was very understanding. Once capable, I had the Highland Wagyu rump steak and Andrew had the Earl Stoneham sirloin. The chef recommended that the rump be served medium-rare and the sirloin rare. Both arrived impeccably cooked, lightly caramelised on the outside and well rested, yet still nice and hot. The steaks were both utterly divine and also remarkably different. The rump, whilst exquisitely tender, had more texture to it and had a richer, more intensely beefy flavour. Whereas the sirloin had a silky, melt-in-the-mouth texture and a more delicate buttery flavour. 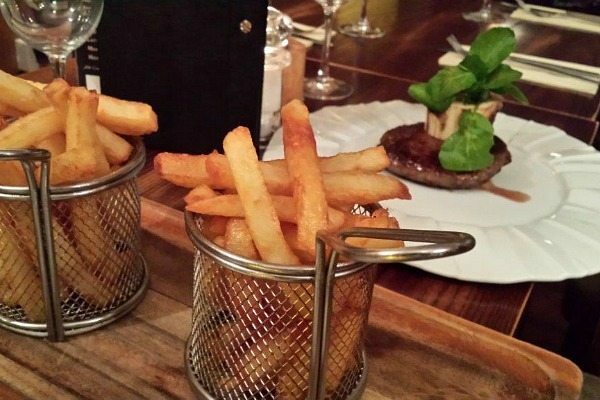 The steaks came with baskets of perfectly crispy, golden fries, a generous portion of bone marrow and a sprig of peppery greenery. 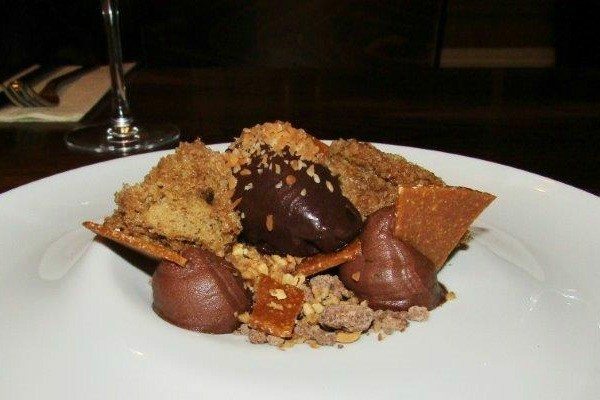 For the sake of our waistbands we should have left it there but the desserts looked too good to miss so we opted to share the hazelnut cremeaux, chocolate soil, coffee sponge, caraway and a roasted cocoa gelato. A pleasing riot of textures and an intense mix of salty and sweet, chocolatey and nutty, rich and creamy and altogether decadently sinful! I washed down pudding with a lovely glass of sparkling wine and Andrew rounded out his meal with a delicious-smelling Irish coffee. When our fellow diners at neighbouring tables clocked that we were doing a review they couldn’t help but wax lyrical about the dishes they’d had too so you needn’t just take my word for it. There are vegetarian options and I am sure they are equally glorious but our feast was an unabashed celebration of meat (the only vegetables we saw all evening were pickled or decorative) and all I can say is if you’re a carnivorous food hedonist you simply must go! The food was, in a word taste-gasmic! The bread and pickles cost £5 then each meat or cheese option is £3. The steaks were not cheap at £30 for the rump and £35 for the sirloin but they were a real treat!